Senna's third and final race of the season, the San Marino Grand Prix, was held on the "Autodromo Enzo e Dino Ferrari" circuit located in Imola, Italy. Imola had traditionally been considered the beginning of the F1 season proper, on European soil. Senna, having not finished the two opening races of the season, declared that this was where his season would start, with fourteen races, as opposed to sixteen, in which to win the title. Senna again placed the car on pole for a then-record 65th and final time, but he was particularly upset by various unfolding events that race weekend. On the Friday, during the afternoon qualifying session, Senna's compatriot and Brazil's hope for the future, Rubens Barrichello was involved in a serious accident when his Jordan became airborne at the Variante Bassa chicane (the last of the circuit) violently slamming into the tyres and fence. In the impact, Barrichello swallowed his tongue and suffering a broken nose and arm - injuries that prevented him from competing in the race. Senna's concern was such that, upon being denied access to the circuit's Medical Centre, he climbed a fence to be by Barrichello's side (with Barrichello indicating that Senna was the first person he saw after regaining consciousness). The next day, Saturday, Austrian driver Roland Ratzenberger was killed in qualifying in a devastating accident when the front wing broke on his Simtek-Ford while going flat out at the fast Villeneuve right-hander bend and into the concrete wall. A distraught Senna requested a track marshall to take him to the site of Ratzenberger's fatal crash where he was met by FIA's Medical chief Professor Sid Watkins. As reconfirmed numerous times over the years, Professor Watkins suggested to Senna on that very occasion to stop racing and go fishing (a hobby they both shared), to which Senna responded that he could not and that he had a lot more to accomplish. In order to obtain more news about his second injured colleague that weekend, Senna again climbed the fence of the Medical Centre after his inspection of the crash site. The fact that he commandeering of an official's car to visit that site resulted in FIA officials approaching him with a view to admonish him. This disconcerted Senna no end but, ultimately, FIA chose not to take any formal disciplinary actions. Senna was so touched that it is said he wrote a letter of condolences to Ratzenberger's family. Throughout the weekend, his then girlfriend, Adriane Galisteu has been claiming that she received various phone calls indicating that Senna had lost the desire to race on Sunday. Indeed, even his then boss, Frank Williams, stated that up until Sunday morning, he was uncertain about Senna taking part in the San Marino Grand Prix. Senna spent his final Sunday morning perturbed but making time to meet with fellow drivers to discuss the re-establishment of a Driver's group (i.e. Grand Prix Drivers' Association) to increase safety in Formula One, due to the tragic events that weekend. As the most senior driver, he offered to take the role of leader, starting from the next race event in Monaco. During the drivers' briefing for the race, complaints were raised about the commercial gimmick of a Porsche 911 lead car for the warm-up lap. As the warm-up lap neared, Senna again queried the closeness of the Porsche and was jokingly told by his team's chief engineer, Patrick Head, that the 911 would remain close by, as per the preceding races. Instead, the Porsche was ordered to leave earlier, to Senna's content. At race start of the Grand Prix race, Senna retained the lead from Schumacher but proceedings soon became interrupted by a huge accident on the start line, caused by JJ Lehto's Benetton-Ford stalling, and an unsighted Pedro Lamy ramming him in his Lotus-Mugen Honda at nearly full speed. A wheel was torn off the car and landed in the main grandstand, injuring eight fans and a police officer. The safety car - which was a sporty version of the medium family sedan, Opel Vectra - was deployed and the drivers followed it for several laps. The Vectra's slow pace was later questioned due to the consequential drop in tyre pressures on the Formula One cars. In fact, under those safety car conditions, video footage shows Senna pulling alongside the Vectra, gesticulating to the Vectra driver, Max Angelelli, to increase his speed. On the restart (lap 5), Senna immediately set a quick pace with the third quickest lap of the race, followed by Schumacher. As Senna entered the high-speed Tamburello corner on lap 6, the car left the track at high speed, hitting the concrete retaining wall at around 135 mph (217 km/h). In less than 2 minutes after crashing, Senna was extracted from his race car by Professor Sid Watkins and his medical team. Initial treatment took place by the side of the car, with Senna having a weak heartbeat and significant blood loss. Due to the neurological signs of Senna Professor Watkins performed an on site tracheotomy and requested the immediate airlifting of Senna to Bologna's Maggiore hospital, where he was to be declared dead hours later. It is believed that the right front wheel catapulted back into the cockpit, striking Senna on the right side of his helmet, forcing his head back against the headrest and causing fatal skull fractures. A piece of the upright attached to the wheel partially penetrated his helmet causing the previously mentioned injury to his forehead. In addition, it appeared that a jagged piece of the upright assembly penetrated the helmet visor just above his right eye. Senna suffered two heart arrests while being treated by the track side and in the helicopter, with the race restarting just as Senna was being admitted in the intensive care unit of the Maggiore Hospital in Bologna. A further heart arrest was suffered while in intensive care. It was later revealed that, as medical staff examined Senna, a furled Austrian flag was found in his car—a flag that he had intended to raise in honour of Ratzenberger after the race. Photographs of Ayrton Senna after the accident were taken by Senna's friend and Autosprint's picture editor, Angelo Orsi. Out of respect, those photographs have never been sold to interested parties. 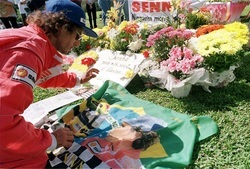 Senna's death was considered by many of his Brazilian fans to be a national tragedy, and the Brazilian government declared three days of national mourning. Contrary to airline policy and out of respect, Senna's coffin was allowed to be flown back to his home country not as cargo but in the passenger cabin of Varig's McDonnel-Douglas MD-11 commercial jetliner (registration PP-VOQ (cn 48435/478)), accompanied by his disraught younger brother, Leonardo, and close friends. An estimated three million people lined the streets of his hometown of São Paulo to offer him their salute. Many prominent motor racing figures attended Senna's state funeral, notably Alain Prost, Jackie Stewart, Damon Hill and Emerson Fittipaldi who were among the pallbearers. However, Senna's family did not allow FOM president Bernie Ecclestone to attend, and FIA President Max Mosley instead attended the funeral of Ratzenberger which took place on May 7, 1994, in Salzburg, Austria. Mosley said in a press conference ten years later, "I went to his funeral because everyone went to Senna's. I thought it was important that somebody went to his." Senna was buried at the Morumbi Cemetery in his hometown of São Paulo. His grave bears the epitaph "Nada pode me separar do amor de Deus" which means "Nothing can separate me from the love of God". A testament to the adulation he inspired among fans worldwide was the scene at the Tokyo headquarters of Honda where the McLaren cars were typically displayed after each race. Upon his death, so many floral tributes were received that it overwhelmed the large exhibit lobby. This in spite of the fact Senna no longer drove for McLaren and that McLaren, in the preceding seasons did not use Honda power. Senna had a special relationship with company founder Soichiro Honda and was beloved in Japan where he achieved a near mythic status. For the next race at Monaco, the FIA decided to leave the first two grid positions empty and painted them with the colours of the Brazilian and the Austrian flags, to honour Senna and Ratzenberger.